So - we have all read (or seen a movie of) the trendy set of YA books that have been set upon us like a rash by publishers covering vampires, werewolves or some other such non-sensical paranormal mythology. Some I have truly enjoyed; others I have wanted to hunt down the author and throttle them for hopping on the money train then lacking any form of creativity. Not this time fortunately! I have always enjoyed the Greek mythology section of my humanities classes. They had such an intricate system for explaining the deep mysteries of the cosmos. Unfortunately, in terms of modern literature, there has been a very short-sighted focus on one aspect of Greek mythology--the Greek gods! Or maybe if you are lucky in YA fiction, you get to see their demi god children. Karen Amanda Hooper takes us to another side of Greek mythology, the creatures of the deep! Those hideous monsters of the sea, with their nightmare stories. Except - wait! - this is a good side of the ugly demons. 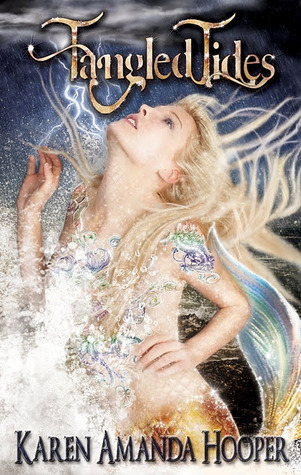 Tangled Tides was a compelling starting point for the world of mermaids, selkies, gorgons, and sirens. Not the usual superstars of the Greek stories, but in my book, some of the most fascinating. It also, perhaps, leaves some room for artistic license to build upon that which is not heavily canonized. I must admit the first couple of chapters made it hard reading for me, but once I got 1/4 of the way into the book, it really seemed to find its legs (hehe-pun). I didn't seem to click with any of the characters right off the bat; however, I did appreciate them being older teenagers. As the story went along, there ended up being a nice array of characters. I definitely had my gripes about several and think they could easily have been left out of the novel, but you can't love every character you come across. There were a fair amount of plot twists to keep the story moving and fresh. Visualizing location was not difficult. The descriptions were wonderfully balanced between visual and not overly flowery. However, I wish this treatment would have been used in more depth for the characters. Many of them just floated along the story with no face in my mind because I honestly kept forgetting what they were supposed to look like. A good attempt from a first time indie author. I give this book 4 stars because it really caught my curiosity for the side of Greek mythology I had not known an extensive amount about. I would certainly recommend it. I even look forward to the sequel.